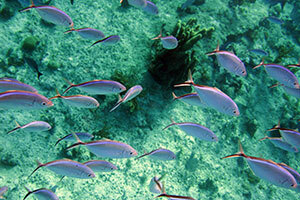 Many volunteer SCUBA divers collect data on the marine environment every year. Now research shows that the divers do not have to use traditional, scientific methods to make a valuable contribution to science. A more simple and popular method has shown to be consistent with the professional method. The findings from the Center for Macroecology, Evolution and Climate at the University of Copenhagen may encourage managers and scientists to make greater use of the thousands of existing records produced by volunteers. Data collected by volunteers can pose a dilemma for scientists. Volunteers are a great resource for collecting large amount of field data, but the methods they use are often less standardised than the professional ones. That means scientists hesitate to use volunteer data. “What our study was able to show, is that the common ‘roving diver technique’ used in marine volunteer surveys is able to compete with more strict methods. The volunteer method has been used in more than 160.000 underwater surveys across the world, so there is a huge amount of data available collected this way. If analysed with advanced statistics, we can see that the data delivers results of high quality, and that may help scientists overcome their hesitation towards it” says lead-author Ben Holt from the Center for Macroecology, Evolution and Climate (CMEC) and the University of Copenhagen. When scientists collect data, their methods are specifically designed to minimise bias, maximise precision and ensure repeatability. However, when designing protocols for volunteers, a less strict approach is often chosen to maintain the interest and motivation of the participants. 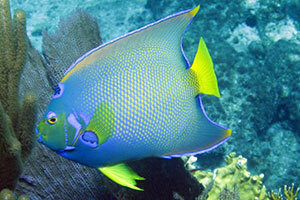 Queen angelfish. Photo credit: Jan Lupton. “Allowing volunteers to use flexible and less standardised methods has important consequences for the long term success of citizen science programs. Amateur enthusiasts typically do not have the resources or training to use professional methodology. Our study demonstrates that with the correct statistical analysis, the quality of data collected using a volunteer method can match protocols used by professional scientists” says Ben Holt. Ben Holt and his colleagues compared the roving diver technique - a common voluntary survey method where divers swim around an area and actively search for and record all possible fish species, with a standardised method where fish species are recorded along transect lines. 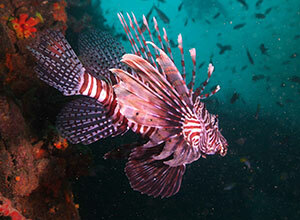 The study took place in three Caribbean sites. While the traditional scientific survey method revealed sightings of 106 different types of fish, the volunteer technique detected greater marine diversity with a total of 137 in the same waters. “Very few, if any, scientific groups can collect data on the scale that volunteer groups can, so our results that show the methods return consistent results is very encouraging. The natural world is still largely unexplored and at the same time it is highly impacted by environmental change. We need to use all available resources to measure the effect”. After the encouraging new results for volunteer surveys, further work by the research team will address other concerns with volunteer datasets. “It is important to note that our study does not consider the survey abilities of the individual SCUBA divers and this is also an important consideration for any large scale biodiversity program. By addressing these issues we can make important steps towards enabling the large pool of volunteer enthusiasts to help professional researchers by collecting valuable data across many ecosystems,” concludes Ben Holt. The results are published in the journal Methods in Ecology and Evolution.